The US Forest Service, Bureau of Land Management, US Fish & Wildlife Service, and National Park Service permanently protect some of the finest examples of natural ecosystems as Research Natural Areas (RNAs). The Bureau of Land Management also has a category called Areas of Critical Environmental Concern (ACEC). The purpose of RNAs is to use them in scientific studies and educational activities. They provide protection of biological diversity at the species, ecosystem and landscape levels. RNAs also serve as reference areas or controls when baseline-monitoring occurs. Natural history studies and educational use by native plant societies and environmental groups continues to occur in the Nez Perce – Clearwater National Forests, the Idaho Panhandle National Forests, and on public lands managed by the Bureau of Land Management. Below are descriptions of RNA’s located on the Clearwater portion of the Nez Perce – Clearwater National Forests. 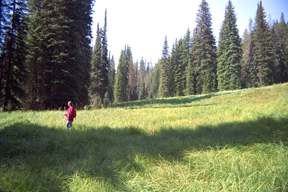 Sneakfoot Meadows RNA is at 6,000 feet elevation and occupies a flat glaciated basin in the northern Bitterroot Mountains. The RNA features a variety of sedge meadows and sphagnum bogs surrounded by several kinds of subalpine fir forest habitat types together with old-growth Englemann spruce. Both elk and moose make heavy use of the meadows and adjacent conifer cover. A low gradient, first and second order stream (E channel) meanders through the forested and wetland complex. Abundant growth of aquatic moss occurs here and herbaceous riparian growth shades the stream occupied by Westslope – cutthroat trout. Oxbows representing old stream channels provide standing water for aquatic biota. Lochsa RNA is 1,281 acres and located on both sides of the Lochsa River. It occupies a refugium within which coastal species have survived in isolation since the Pliocene epoch and uplift of the Cascade Mountains. The flowering Pacific Dogwood and red alder are featured species there. 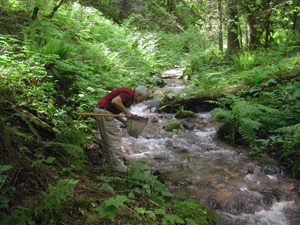 Three permanent high-energy streams dissect the steep slopes and the dense canopy and deep pools contribute to the high diversity and biointegrity of macroinvertebrates in Apgar and Glade Creek. The site is adjacent to Apgar and Glade Creek Campgrounds. Four-Bit Creek RNA contains a small second-order meandering stream forming the northeast boundary of the RNA. It has a sand/gravel substrate and is very sinuous. A high diversity of macroinvertebrate species occur here in the gravel/sand substrate compared to only a few species in the sand substrate. The channel is shaded by sedges and shrubs which comprise a well developed riparian zone in a stringer meadow (see below). The floodplain includes large areas of tall-forbs with no conifers. Thinleaf alder and red osier dogwood adjoin the streambed in places. 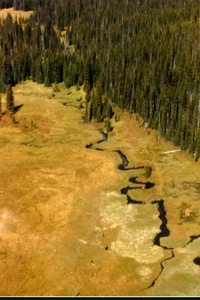 The stream’s presence in the Clearwater Mountains is representative of the most productive forest land in the Northern Rocky Mountains. 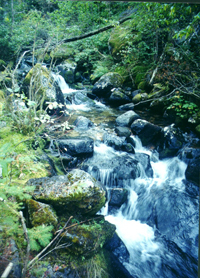 Four-Bit Creek runs into Eldorado Creek forming the northern border of the RNA. Eldorado Creek flows into Lolo Creek then into Middle Fork Clearwater River. The creek is on the Lolo trail, which is a historically important Nez Perce pathway across the Bitterroots. 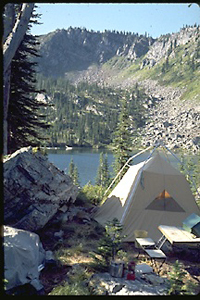 Steep Lakes RNA is 784 acres and located on the Idaho/Montana stateline. It also overlaps with the Kelly Creek Roadless Area. Surrounding forests are dominated by mountain hemlock and subalpine fir with some whitebark pine and Sitka alder present. Golden trout (relatively rare in Idaho) were planted in the lower lake in 1962. A graduate study compared invertebrate communities in the upper fishless lake with the lower stocked lake as to size-selective predation by the trout. Most invertebrates were smaller in the lake stocked with fish. The presence of large size freshwater shrimp there may be due to relatively high alkalinity in the water. This shrimp species has not been reported in other mountain lakes in northern Idaho where alkalinity is much less. Water and plankton samples from Upper Steep Lake were collected following the 1980 eruption of Mt. St. Helens to determine what effect, if any, the ash had on lake productivity. There was no lasting effect noted. Bull Run Creek RNA is 373 acres and contains plant communities along with Western redcedar and grand fir forests that are located on soils derived from basalt together with loess and volcanic ash. Forest climax type is Western redcedar/lady fern indicating a moist, warm site. Area once supported Coastal Disjunct species but Dworshak Reservoir inundated part of these ranges. The stream has a moderate – steep gradient that has cut through lava. It consists of a confined channel upstream with little soil present among the boulder and cobble banks. Downstream the creek continues through a shallow valley bottom with gentle slopes on both banks flowing its entire length through a coniferous forest. Pocket pools and small channel bed depressions formed behind boulders, are common in the riffle habitats. A short distance north of the RNA is Bull Creek Falls where the creek cascades over basalt cliffs in several cataracts. The impressive Elk Creek Falls is 1 mile east. Aquarius RNA is 3,900 acres and supports one of the most unique and best remaining examples of coastal related vegetation in the Northern Rockies. Elevations range from 1,600 – 3,995 feet. It is a nearly complete river canyon environment with properties similar to coastal regions. It contains the largest remaining red alder habitats not innundated by Dworshak reservoir. It has a high diversity of ferns, an abundance of regional endemic and Coastal Disjunct plant taxa, undescribed species of earthworms, newly described and undescribed species of terrestrial beetles. 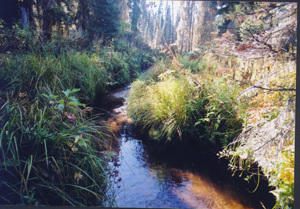 In addition, the Coeur d’Alene salamander and contrasting macro-invertebrate communities from different streams occur here. There are six first-order and two second-order tributaries and a waterfall besides a section of the North Fork Clearwater River in the RNA. In addition, ephemeral seeps, some with steep rock outcrops, support a diversity of herbaceous vegetation. Landslides and slumps characterize the slopes with alluvial and colluvial fans along the river. Often the steep slopes extend directly to the river edge. Bald Mountain RNA is located on the crest of the divide between the North Fork Clearwater and Lochsa Rivers. In a densely forested country, Bald Mountain is an open south-facing slope grassland caused by snowy transfer and drouthy soils. Of special interest are the green fescue and associated beargrass communities. Forests here have resulted from the 1929 fire; in fact most natural stands on the Clearwater portion of the Nez Perce – Clearwater National Forests have once been burned. Bedrock geology underneath Bald Mountain is intruded Idaho Batholith. Over the years, the Lolo Trail, passing through the RNA, was used by Indians, trappers, miners and explorers. As the grassland bald was one of the few openings amongst the dense forests, it was used for camping and feeding livestock. Bald Mountain Lake is not part of the RNA. However, the lake has been used as an outdoor laboratory to teach aquatic ecology concepts. Dutch Creek RNA contains a first-order tributary to the Lochsa River. It is a steeply graded pinnate drainage, actively downcutting. Dutch Creek is primarily a cascade-pool type stream flowing over cobble and huge boulders. Within .5 mile, the channel descends 400 feet. Outside the narrow riparian zone, vegetation is early seral forest and shrubfields. Many large snags remain standing along the stream from early fires and the stream is crisscrossed with downed logs. A number of moss and liverwort taxa are identified in the channel. The major feature of the RNA is old stands of northwest paper birch. Chateau Falls RNA consists of Chateau Creek, a third-order stream, that joins with Cave Creek before its confluence with the North Fork Clearwater River in the Pot Mountain Roadless Area. It is a high-gradient, cascade-pool type stream in pink granite bedrock. The lower third of Chateau Creek is in the RNA. Along Cave Creek at the western boundary, the vegetation consists of a narrow stringer of primary deciduous trees and shrubs which includes paper birch and Rocky Mountain maple. Upstream from the confluence with Chateau Creek, Rocky Mountain maple dominates the overstory. 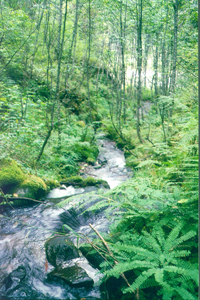 The widest areas of the stream bottom are occupied by a tall shrub layer of thin-leaf alder, Rocky Mountain maple, serviceberry and a variety of understory plants. The forest habitat type is Western redcedar/queencup bead lily. An open forest overstory of Douglas fir with many large snags are still standing from the 1930 fires. The main reason for the establishment of this RNA is four spectacular waterfalls, some of which measure up to 80 feet in height with water cascading from one step to the other. The upper falls drops about 45 feet over a sheer granite face, then cascades through a series of basins in the bedrock. The stream volume, however, is not enough to create much spray. 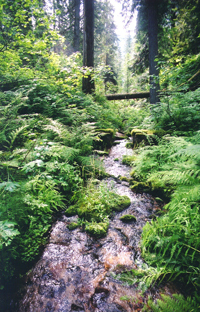 Learn about RNA’s on the Nez Perce portion of the Nez Perce – Clearwater National Forests.